After the sale of Sitmar Cruises to the P&O Group in 1988, the Monaco-based company V-Ships (former Vlasov Group) ended being a cruiseship-owner. The company now concentrated on ship services and management as well as the rebuilding of (smaller) ships for niche brands like Radisson Seven Seas Cruises and Swan Hellenic. Involved in the transaction of Sitmar Cruises from Vlasov to P&O was also Antonio Lefebvre d'Ovidio, an entrepeneur from Rome specialized in maritime law. Also his son, Manfredi, was involved in his fathers business and together with the Vlasov Group, a new cruise-venture was started in 1993 under the name of Silversea Cruises with Manfredi taking the helm. Instead of using exsisting hulls like they had done before, two new ships were ordered from the Visentini wharf at Viareggio in Italy. They would recieve the names of Silver Cloud and Silver Wind, somewhat familiar for V-ships, that once owned a large freightfleet under the Silver Line brand, where all names of the ships started with 'Silver'. The first ship was launched at the 6th of march 1993 from the Cantieri Navali Visentini wharf at Viareggio in Italy. Here, her yardnumber had been 775. The ship measures 16.927 tons and she is 155 meters long, 21,40 meters wide and her draft reaches 5,30 meters. She was designed for 296 passengers and 185 crewmembers, so this ratio shows the luxury style that Silversea Cruises wanted to offer. There are eight decks and the normal sailing speed is very moderate, around 17 knots. The ship was to fly the flag of the Bahamas, homeported in Nassau. Because Vinsentini doesn't have the room for completion of the ships, this was carried out at the Mariotti wharf at Genoa. Below, Silver Cloud is seen sailing the Northsea Canal passage from Amsterdam at the 4th of june 2006. She is designed quite different from most cruiseships, as her passenger accomodations are all located forward and of those cabins, 77% has its own private balcony. All public rooms are located aft. These rooms are smaller of course then on the larger ships, but for the number of passengers carried adequate enough. Besides, Silversea's passengers mostly do not care for large-scale activities or unique innovations. They will more likely want to read a book in a quiet corner or so. For this, the ship is truly perfect. She is larger then most traditional expeditionships, but large enough for good sea-quality and a wide array of entertainment in Silversea's own style. For example in the main dining room (conveniently named 'The Restaurant'), which has a domed ceiling and is the most splendid room aboard, musicians are hired to play in between the courses and passengers are even invited to dance sometimes. But do not expect Metallica or Muse, the music played is more likely to be classic ballroom style. Next to this, also there is the possibility to enjoy movies outside at the pool deck or just a good cocktail in one of the ships bars. Also, small style shows or classic concerts are performed in the showroom, the Venetian Lounge, that is spread over two decks. There also is a small casino aboard, just like several boutiques, a fitness center and Spa area. As a nice extra touch with Silversea, all beverages are also included in the fare, with the small exclusion of several specials from the Conoisseurs List. A special dining option is also given, when at night the Pool Deck is the place for Black Rock Dining. This concept is used throughout the fleet and it means that passengers can cook their own meals at lavastones pre-heated at 1600 degrees Fahrenheit. Above, Silver Cloud sails the Northsea Canal close to Velsen-Noord at the 11th of june 2014. Her name, Silver Cloud, is well known by fans of Rolls Royce, as it is also the name of a car of their design which was produced between 1955 and 1966. It is often named as one of the most beautifull cars ever to drive the roads. 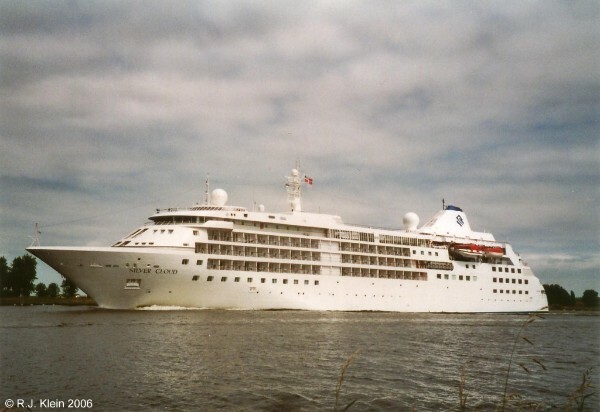 'Our' Silver Cloud was delivered to Silversea Cruises at the end of march in 1994. She had been launched from the yard one year earlier, at the 6th of march 1993 and she began her Maiden Voyage at the 2nd of april in Civitavecchia, the port of Rome. Her normal sailingscedule took her to northern Europe and the Mediterranean in summer, while sailing the Caribbean and South America in winter. She is also seen crossing the Suez Canal into the Red Sea and along to the Persian Gulf, sailing from Jeddah and Dubai. In 2012, the ship recieved a make-over throughout, in which her public rooms and cabins were refurbished and her general look inside was updated. She seems to be a very sportive ship too, as in 2016, Silver Cloud was chartered for the summer Olympic Games in Rio de Janeiro, Brazil to be a home for the US national basketballteams from both the men and the women. With the main company of Silversea Cruises being extended with more larger ships, the 36.000-ton Silver Spirit in 2009 and the 40.000-ton Silver Muse in 2017, Silver Cloud was rebuild for the companies Silversea Expeditions brand in november of 2017. For this, the ship was recieving an ice-strenghtened hull as her voyages would bring her to the Arctic and Antarctic regions in her new role and for those cruises, her passengercapacity is reduced to 200. For cruises outside these regions, 260 passengers can come along. For Silversea Expeditions, the ship also recieved a dark hull, improving her appearance and a collection of 10 kayaks and 16 zodiacs small inflatable rafts) were added. Also, a team of 22 expeditionexperts is aboard to enrich the total experience..